He married Fannie Gennette Lawhon, about 1894.1,2,5 Fannie was born Nov 24 18691,2,5,6 [186712, about 187913], North Carolina1,2,5,6. 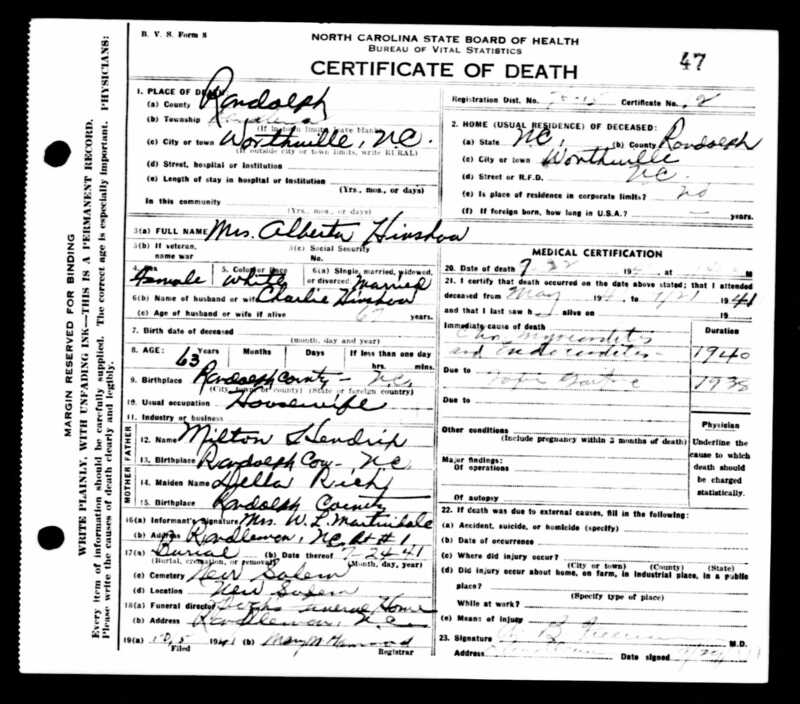 Hinshaw, Charles W., head-of-household, age 27, born Apr 1873 in North Carolina; parents born in North Carolina; married 6 years; occupation: farmer; rented farm. Hinshaw, Fannie G., wife, age 30, born Nov 1869 in North Carolina; parents born in North Carolina; married 6 years; 4 children, 4 living. Hinshaw, Ollie F., daughter, age 4, born June 1895 in North Carolina; parents born in North Carolina. Hinshaw, Lillie W., daughter, age 3, born Apr 1897 in North Carolina; parents born in North Carolina. Hinshaw, Nora E., daughter, age 1, born Aug 1898 in North Carolina; parents born in North Carolina. Hinshaw, Inez I., daughter, age 1 month, born Apr 1900 in North Carolina; parents born in North Carolina. Hinshaw, Charles W., head-of-household, age 36, born in North Carolina; parents born in North Carolina; first marriage, married 16 years; occupation: farmer, general farm; owned farm (free). Hinshaw, Fannie G., wife, age 40, born in North Carolina; parents born in North Carolina; first marriage, married 16 years; 6 children, 6 living. Hinshaw, Ollie F., daughter, age 14, born in North Carolina; parents born in North Carolina; occupation: spinner, cotton mill; attended school. Hinshaw, Lily M., daughter, age 12, born in North Carolina; parents born in North Carolina; occupation: spinner, cotton mill; attended school. Hinshaw, Nora E., daughter, age 11, born in North Carolina; parents born in North Carolina; attended school. Hinshaw, Ivey I., daughter, age 9, born in North Carolina; parents born in North Carolina; attended school. Hinshaw, Fred G., son, age 7, born in North Carolina; parents born in North Carolina; attended school. Hinshaw, Jesse P. [..middle initial unclear..], son, age 4, born in North Carolina; parents born in North Carolina. Hinshaw, Charles W, head-of-household, age 46, born in North Carolina; parents born in U.S.; owned home (free); occupation: farmer, general. 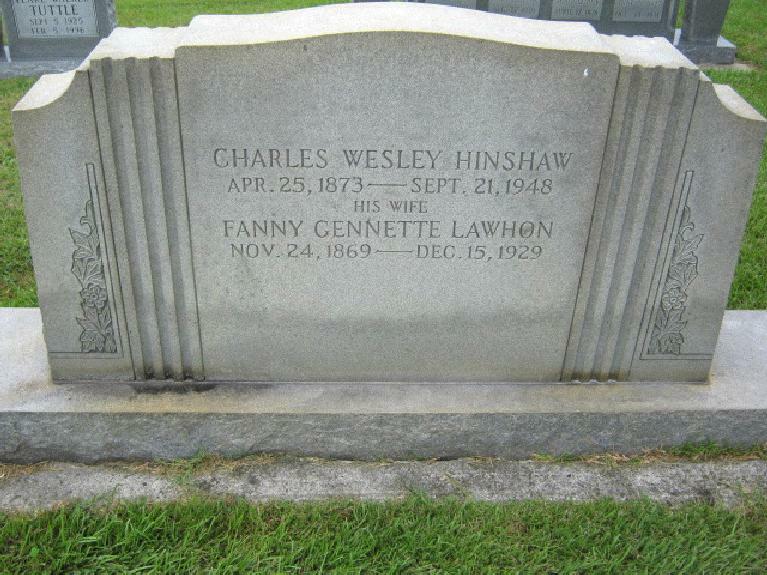 Hinshaw, Fannie G, wife, age 51, born in North Carolina; parents born in U.S.
Hinshaw, Fred G, son, age 17, born in North Carolina; parents born in U.S.
Hinshaw, Jessie P, son, age 14, born in North Carolina; parents born in U.S.; attended school. Hinshaw, Charles W., head-of-household, age 57, born in North Carolina; parents born in North Carolina; widower; owned home; no radio in home; occupation: foreman, [..unclear..] camp. Hinshaw, Nora E., daughter, age 27, born in North Carolina; parents born in North Carolina; single. Hinshaw, Jesse, son, age 23, born in North Carolina; parents born in North Carolina; single; occupation: mason, brick. Hinshaw, Charles W., head-of-household, age 67, born in North Carolina; completed 1 year of high school; on Apr 1 1935 was living in the same house; owned farm ($800 value); occupation: operator, farm. Hinshaw, Alberta, wife, age 62, born in North Carolina; completed 6th grade; on Apr 1 1935 was living in the same house. Hinshaw, Jesse P., son, age 34, born in North Carolina; completed 7th grade; on Apr 1 1935 was living in the same house; single; occupation: brick mason, private bldg. ; worked 26 weeks in 1939; $1040 wage in 1939. 1910 census, Worthville, West Franklinville Precinct, Randolph County, North Carolina; roll T624-1128, ED 86, page 137A, line #19, dwelling #6, family #6. 1930 census, Franklinville Township, Randolph County, North Carolina; roll T626-1715, ED 15, page 14A, line #37, dwelling #301, family #347. 1920 census, Worthville, Randleman Township, Randolph County, North Carolina; roll T625-1318, ED 112, page 4A, line #47, dwelling #208, family #208. 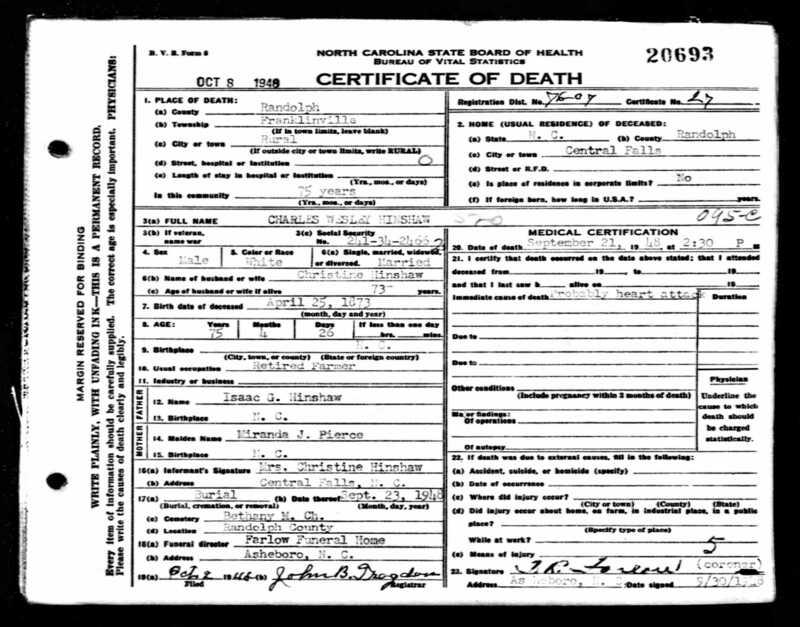 Jesse P. Hinshaw death certificate. 1940 census, Franklinville Township, Randolph County, North Carolina; roll T627-2961, ED 76-18, page 24A, line #31, household #448.